The settled sunny weather continues and you'd be forgiven for thinking summer was still lingering but on Thurstaston Shore this morning the east wind confirmed we are trundling towards the cold season. However, this means good birds on the Dee so I can cope with the drop in temperature, although tomorrow I'll be packing gloves! The day started well with a brisk cycle along South Parade to view the Marine Lake. 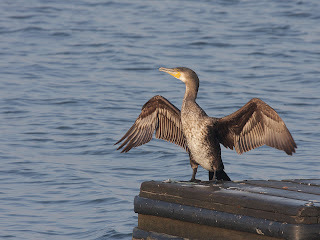 Not much on the water but the regular Cormorant on the landing stage was enjoying the morning sun, hanging it's wings out to dry. Not much moving on the Wirral Way in contrast to the last few days, but plenty of Starlings around. I can see across the golf course that there is a mass of Oystercatchers on the mudflats. Fingers X-ed it'll be the same story at Thurstaston. Wasting no time it's straight down to the shore, the east wind chilling the cheeks but the misty, tranquil atmosphere warmed the heart. Redshank obvious on the first scan with the binocs. Scope out and start to count. 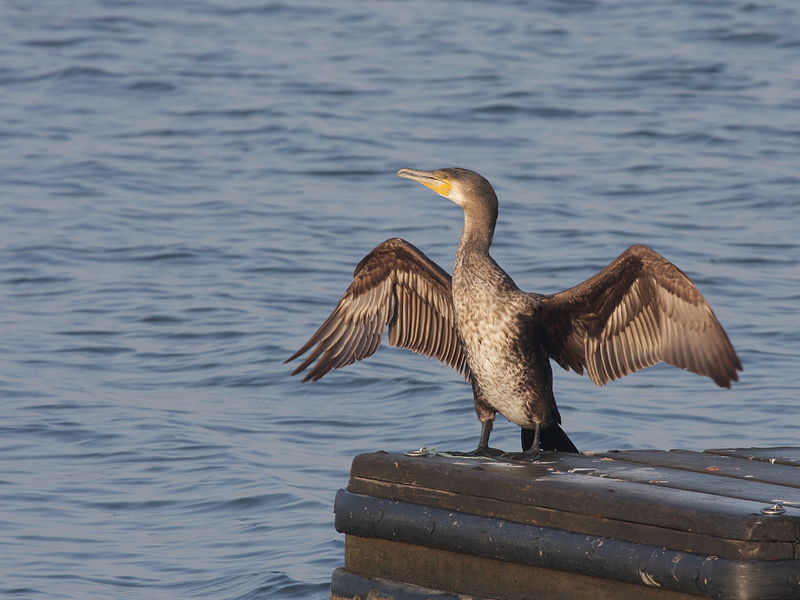 Close to a thousand, but they are skittish and keep flying for the safety of the channel. A Carrion Crow stoops on a feeding group and they are sent reeling, piping angrily. The crow continues to test the flock, looking for a weak or injured individual. It's busy overhead too, 150 Jackdaws are high above the sand, noisy and aggressive amongst themselves. 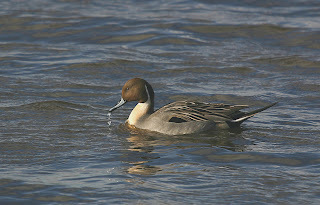 More visible migration - good, I'm a fan of that phenomenon, see yesterday's post! 40 Black-tailed Godwits appear overhead and swoop down but land in the channel, out of view. Shucks! No chance of spotting a ringed bird! Plenty of Oycs here too along with 750 Shelduck, the latter pattering through the ooze of the mud filtering food from the muddy menu. A small tight flock of waders zooms in from the left. Binocs on them - Knot! Cool, new arrivals. There were 0 this time last week. Fresh in from the Arctic! Further down the channel I can see some ducks roosting. The light is coming from behind them so I can't see what they are. As I wander in their direction to ID them 4 Pink-feet fly past and a trickle of Mipits passes along the cliffs. Closer to the mystery ducks now and I scope them. 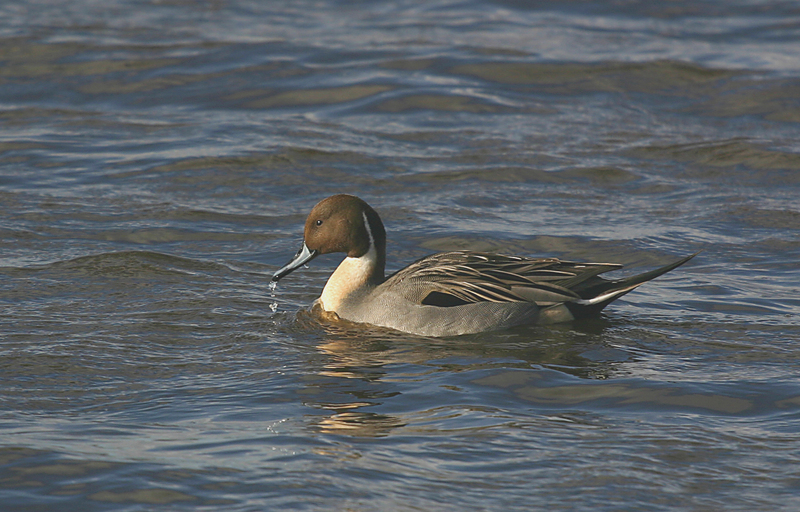 A dozen Pintail. Brilliant, the first of our wintering flock returning! Over the next few weeks numbers should soar to around 1,000. I'll be keeping an eye on them! Blogging early today, off for noodles tonight, we all know I love a well known chain of noodle bar!